Based on a Patricia Highsmith book it tells of a society woman who gambles her wealth and family for an affair with a much younger girl. Here the lead role is filled perfectly by Blanchett, who has the effortless carry of a woman who has always been surrounded by luxury and wealth, who wears a fur coat and drinks a cocktail as easily as breathing. However, she has a brittle, nervous quality which suggests her relationship with husband Kyle Chandler (in a badly under-written part) is not as happy as it should be. They are slowly splitting up and arguing over custody of their daughter. One winter’s day Carol walks into a department store for a spot of Christmas shopping for her daughter, and is helped by downtrodden assistant Therese (Rooney Mara). 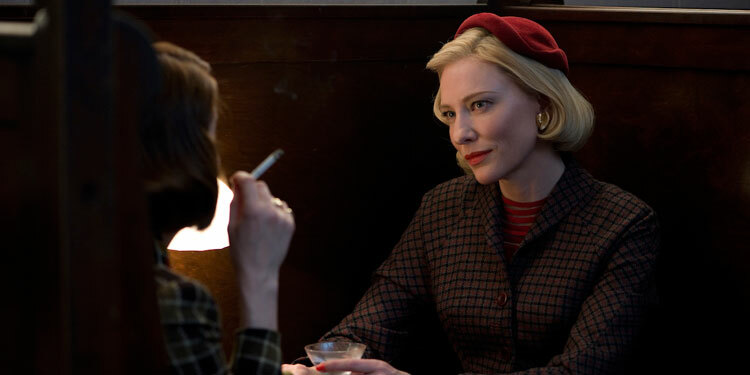 The two strike up a conversation, Carol leaves her gloves on the counter, Therese returns them, they meet for lunch. In this crucial heart of the film there is something of a gap – it is never really explained why Carol, who has so much at stake, would risk it all to have an affair with this rather mousey young girl. We know little about Therese at the start of the film, and not much more by the end – she has a boyfriend she doesn’t seem to like much, she is gauche, awkward and has little interest in things, she can’t even order her own lunch – as she readily admits. She has a budding interest in photography, that’s about it. When Carol’s divorce proceedings get ugly she decides to leave town, and the pair go on a classic American road trip, staying at grubby motels, eating in diners and gazing dreamily at the empty, flat skies from Carol’s huge car. There is very little flesh on these bones – can it just be they fancy each other and no-one else? Is it as simple as that? A couple of times Haynes puts Therese near a lesbian character, both times she flinches and walks away. Is he saying these women are only attracted to each other and no other females? As the two hours wanders dreamily past it becomes clear that this is not Haynes’ masterpiece Far From Heaven, which is braver and far more explicit in its treatment of race and sexuality in the America of the 1950s. By comparison this seems like a slight treatment – perhaps too subtle? There are also two direct references to Brief Encounter at the beginning and end, which a kindly film buff might describe as a ‘homage’…I’m not so sure. 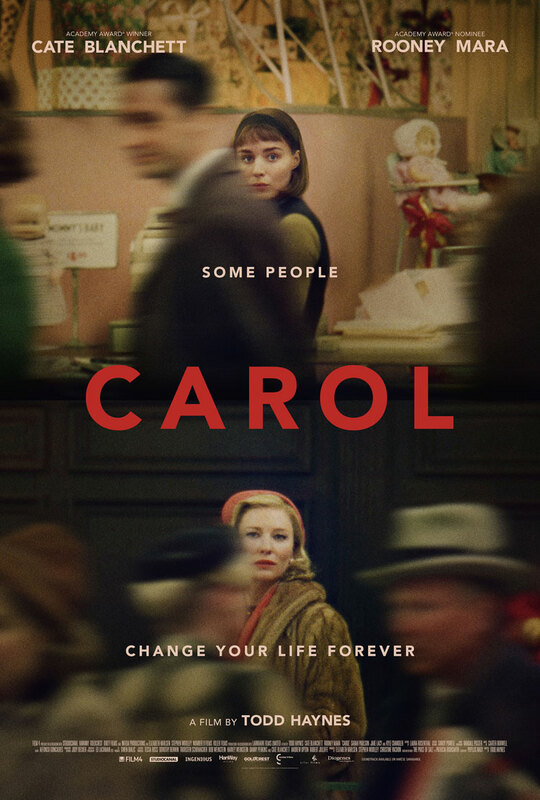 The real reason for watching it is Blanchett’s tremendous performance as Carol. She is made up and coiffured to within an inch of her life, but the cut clothes and curly hairdo cannot hide the fragility of her character. She looks like she might shatter at any moment, and her constant flicking of cigarette ash and sipping of cocktails slowly reveals a woman who is all surface. Even her poor husband admits she is ‘always the most beautiful woman in the room’ even after she treats him so badly. It’s a brilliant portrayal, on a par with her part in Blue Jasmine, which was similar Oscar-bait. Overall verdict: Visually stunning, slow-burning tale which never quite solves its central problem, but which will please Haynes fans. The performances are as immaculate as Blanchett’s suits.